Parrot wranglers and stunt parrots know that a good cardio workout is crucial for proper parrot conditioning and exercise! One of the best cardio workouts for a bird is flying. Considering that it's much safer to fly a parrot indoors rather than outdoors, even with limited space, a parrot can learn to fly in place. Just park your parrot in front of a computer and watch this video of our original stunt parrot Princess Tara demonstrating flying in place. Just as an aside, our Goffin's Cockatoo Kid Kadra learned this technique simply from watching Princess Tara in action! 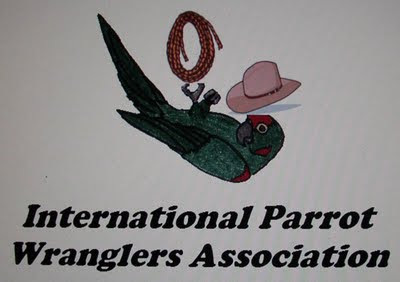 Endorsed by the International Parrot Wranglers Association and the Parrot Wranglers Academy. That's hilarious! What a ham!